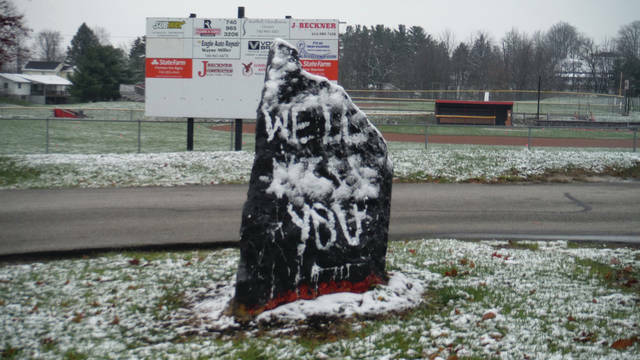 The rock in front of BWHS says RIP Cody (front) and We’ll Miss You (shown) in memory of Cody Segner. The BWLSD State of the Schools Facebook Live event was a great success. BWLSD featured many important topics you’ll want to hear about! Take some time to pull up the videos at the BWLSD Facebook Site and see all the great things going on in Big Walnut. The Board of Education held a special meeting on Nov. 17. There was a 2-Hour Delay for Big Walnut Local School District on Thursday, November 15, due to icy conditions. In honor of the 100th anniversary of Veterans’ Day, the Leo Club organized a donation drive to support local veterans. In memory of Cody Segner, students at DACC will be selling bracelets in the main office. All funds will be donated to the Segner family. If you would like to purchase a bracelet, the cost is $1. Mrs. Mahle will have them at her desk. Reminder to students to check the lost and found in the atrium. Items that are not claimed will be donated to Big Walnut Friends Who Share. For lost keys, phones, wallets, etc. those items will be in the main office. The Drama Department’s production of “Lend Me a Tenor!” took place on Thursday November 15, Friday November 16, and Saturday November 17. The entire sophomore class visited the DACC (Delaware Area Career Center) on Tuesday, November 20. This visit is an opportunity for all sophomores to see what options are available to them for their junior and senior year and decide if applying to the DACC is the right choice for them. Ten BWHS choir members participated in the annual OCC Choir event at Otterbein University. This event brought 250 students together from 32 different schools to rehearse and then perform a concert in the evening. For the evening performance, there were 5 solos awarded to students and 2 of those solos went to BWHS seniors Erica Carper and Marissa Rak. Earlier this year, several of our own BWHS students traveled to East High School in Columbus as part of a cultural exchange program surrounding the release of Wil Haygood’s new book, Tigerland. Tigerland tells the story of Columbus East H.S. in 1968 and the two state championships (basketball and baseball) that brought the community together in the midst of a tumultuous year in American History. On Friday, students from East High visited BWHS and shadowed our students for the morning as part of the second half of this cultural exchange. Save the Date Friday, 12/14/18 EAGLE MADNESS more information coming soon! The BWHS Principal’s Leadership Team held its fourth annual Alumni Hall of Fame Induction Luncheon on Monday. This year’s inductees were Suzanne Link Allen, Class of 1955 and Donna Evans, Class of 1964. The Alumni Hall of Fame was created by the PLT to honor our past alumni and preserve the strong traditions and history of Big Walnut. Suzanne Link Allen graduated from BWHS in 1955. She has been a 4H advisor for over 50 years. She is very involved with the Big Walnut Area Historical Society and serves as a docent at the Myers Inn Museum. Suzanne made a project to honor the graves of veterans in all local cemeteries. She has written ten books and contributed to many others. She was also a teacher at BWMS from 1978 until 2003. Donna (Fling) Evans was in the BWHS class of 1964. She organizes the 4th of July Parade, the Sunbury Cruise-In, and is the former Rotary Club President. She hosts a quarterly free luncheon for military veterans. She has been named the United Way Volunteer of the Year. The American Legion, VFW and Delaware County Veterans have all recognized her with their highest volunteer awards. In addition, she has been the Grand Marshal twice for Christmas on the Square and for Sunbury Fourth of July. BWMS was honored to host over 75 local Heroes today at our 2nd Annual BWMS Veteran’s Day Breakfast. Organized by student and staff leaders, over 300 students help create decorations, invitations, and artwork to support the event as well as the entire school assisted with the clap out of our honored guests. I wish to share special thanks to our CBI students, local Scouts, Student Leadership Council, Staff leaders and many Community Partners for serving such a vital role in the preparation and execution of such an event. The SOARing Staff Award and used to recognize a Big Walnut Middle School Staff Member who goes above and beyond to support the mission of BWLS to inspire and guide each student to his or her maximum potential. Outside Recess — Reminder that we go outside if the temperature is above 25 degrees with windchill. Please remind your student to bring a coat to school and wear it at recess. Arrival — Students are allowed in the building at 7:30 a.m. in the mornings. This is the approximate time the buses release students and determines when we have teachers on duty supervising our students. On Wednesday after the Children’s Theater our PTO did a Read-a-thon kick off where they explained all of the exciting details on this event. Look for a Read-a-thon envelope coming home soon. We are hoping to surpass our goal last year and raise enough money to earn a DANCE PARTY! All Pro Dad’s was Friday, November 16th in the cafeteria. The Lost and Found is growing by the day. Next time you are at BWE, please make sure to check it out. Also, ask your student if he/she has anything that is missing. Anything left over Thanksgiving break will be donated! At the Nov. 15 Board of Education meeting, BWE had a presentation and two students were recognized: Hayden Krous, BWE Student of the Month; Silas Stewart, BWE Art Student of the Month. This past week it was reported to the school that some families are dropping their kids off on Heartland Meadows Drive and/or S. Miller Drive and students are crossing the street to get to school. This is not a safe practice and puts our students at risk! If you are dropping your child off and you can not wait in line, consider parking at the back of the lot and walking your child up to the school. We will be monitoring our arrival and dismissal loops to ensure that this practice stops immediately. Let’s all do our part to keep our kids safe! “Our Veteran’s Day ceremony was beautiful,” wrote Principal Kim Castiglione. “Our kids did such a fantastic job honoring them and were so respectful. One parent said “you must have threatened them good!” and I replied, “No, that’s just who we are. Our kids know the importance of respect and show it well.” I was proud to give my response. First grade students visit the Sunbury Community Library once a month to check out books and learn about content related to what they are learning in the classroom. The students have the opportunity to check out books that get them excited about reading! They also learn the process of searching for a book’s location in the library. During the November visit, the students learned about the history of Thanksgiving. Our school is thankful for these library trips and the learning that happens during these visits! https://www.sunburynews.com/wp-content/uploads/sites/48/2018/11/web1_DSCF9030.jpgThe rock in front of BWHS says RIP Cody (front) and We’ll Miss You (shown) in memory of Cody Segner. Information for this story was provided by the Big Walnut Local School District.